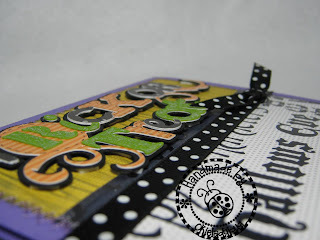 I recently got Celebrate with Flourish *okie wonders if she should tell them that she only had to pay $26 for the cartridge, and then decides she will keep it a secret* and I thought I would make a few Halloween cards with it. Now why I wanted to make Halloween cards I just have no idea since I never send them out. I gave my friend Linda, aka LGuild, the Halloween cards I have made over the last two years so she could send in her box of cards for the Cards For Soldiers program. This was the first card I made with the cartridge. I loved the layers on it. My friend Linda, aka Lguild, was over this past weekend and when she saw it she said there was too much work involved for her tastes. But....what does she know? *okie cracks up laughing knowing Linda is gonna comment on that one*. Since I couldn't do inking on the tiny letters I did add some Stickles to the green letters and then faux stitching on the orange. I used purple thread to stitch around the mat of the card. I think I do prefer the zig zag stitch over a straight stitch most of the time. 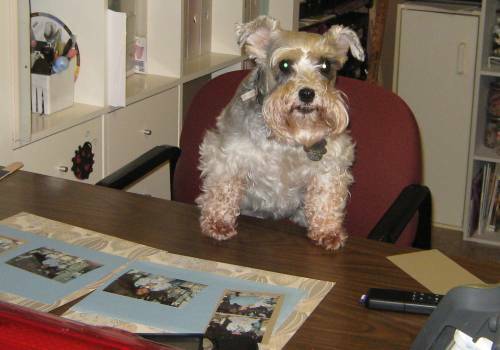 The printed paper is Little Yellow Bicycle, I don't know the line it is from and I am too lazy to go over to the other side of the room and pull some out to see *okie wonders if anyone admires her honesty*. On the yellow cardstock at the top I used the Forrest Branches Cuttlebug folder and then inked over it. I pop dotted the cut off the card and I know you guys are totally shocked by that *okie can just see the eye rolls with that statement*. The ribbon is some that I ordered from Ribbons and Bows Oh My!. I hope you guys did get some ribbon from there while they were running their free shipping special! I tell ya the prices are awesome even when you do have to pay for shipping. 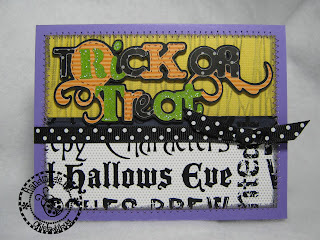 I will be posting three more Halloween cards from Celebrate With Flourish so be sure to check back! Hi Okie, I admire your honesty...and your talent. Poor Linda! TFS! Nifty as usual! I've been very lax in my cardmaking. You've lit my fire! I'll post in a few days from Mini-monsters .. I hope. You're still using some more purple? Love it! I love all the attention you put into the little details such as the faux stitching on the letters - it adds just the right zing to them. TFS and can't wait what you make next. Okie you are just too funny... and I love your honesty. VERY cute card. Maybe your name should be changed to Abe. Cute stuff Okie! And a good idea to send them to the soldiers. With a lot of them coming home soon we don't need to remember there will still be some left to help their gov't run itself. And there will still be war in Afghanistan. We must never forget them! Super cute card worth ALL your efforts! Wow!! LOVE this card!! I would love to find a deal like that, you lucky duck! Like the pattern paper!! and the design!!! great card! I love it! I have been in the Halloween mood AND considering this cartridge...how did you get it for $26??? Go Okie! Love this card! I also want to know how you got the cartridge so cheap!?! That is one on my wish list! I love love love your comments. I love the card. awsome. i also wnant to know where you got that cart so cheap. I love that "Trick or Treat". What a great font - great card all around. TFS. How cool is that?! I LOVE it! 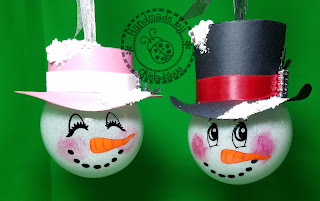 The papers are just perfect and love the Stickles and stitching! FABULOUS card! I really don't need all this enabling so early in the morning, but who am I to back down? I AM GETTING THIS CART! please tell us where you got the cart so cheap. $26 is more affordable for me. You guys have no idea the abuse I take from Okie! LOL! If you've ever been around us when we're together you'd totally understand! Okie and I have about the same sense of humor and we're constantly picking at each other. This card doesn't show all the detail on it in the photo. And, yes, there's just too much work in layering all those little pieces on the letters for me. Okie turns out sets of cards in 4's and takes a lot of time to make them real works of art. I produce hundreds of cards each month to donate so I can't spend so much time on a single layout. Besides, I have NO IMAGINATION! LOL! Oh poor Linda all that abuse. If you have no imagination it is because you have a best friend who is using it all up. LOL You to are a hoot. How did you get this cartridge for $26. Oh yes I love this card every last putsy layer. It is wonderful. I was going to say ... who knew that a simple card with a little lettering would make such a great card ... but then, I looked a little closer. 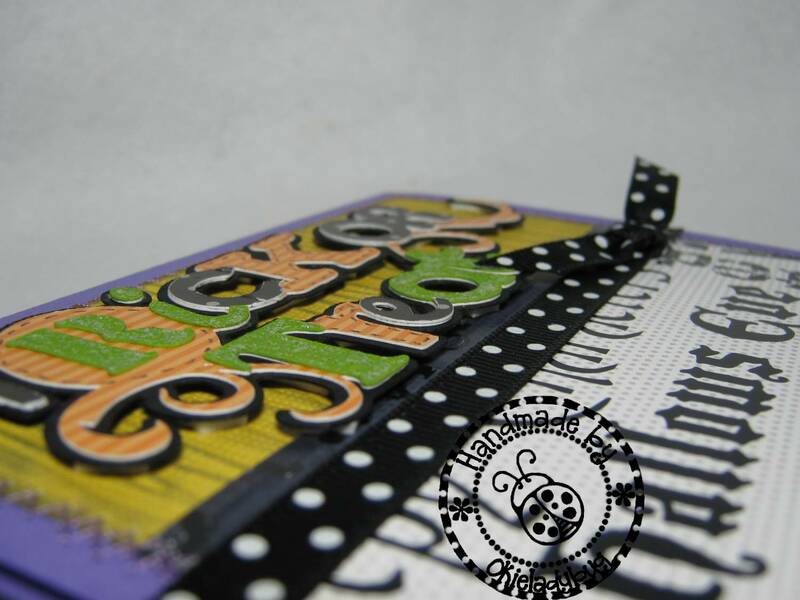 This is NOT simply letters on a card ... You have letters in a great selection of prints and Halloween colors ... hand doodling, even stickles, not to mention a few layers too on those letters ... then layering the bg mats, a little stitching, some inking (we all know that Okie must always do a little inking *wink*) and top it all off with a little ribbon. Yes Sir ... a simple card with a little lettering! Yep, that's what this card is! I love the layering! I sooo want this cart! 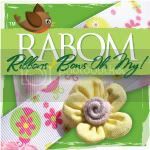 Hey, I just started following your blog and love that you gave a tip about where you buy your ribbon. I've almost exclusively shopped at JoAnn's for all my craft supplies and would like to widen my spectrum to get some good deals. If you have any other go to sites or stores that have awesome deals please post about those!!! Thanks for all the great ideas!